I don’t normally post anything about skiing except occasional videos, but this year I sprang for some new ski apparel to replace my long in the tooth stuff. I am so used to the traditional setup of hard shell layers, especially for the jacket, that I was a bit skeptical about this stretchy soft shell gear. Totally waterproof, super breathable, and incredibly lightweight, AscentShell™ technology is the surefire way to provide high-exertion alpine athletes with complete protection against ice, snow, wind, and however else the weather tries to thwart a perfectly planned ski tour. (from the OR website). Of course, I’ve used the jacket and pants for lift skiing, but haven’t done any skinning yet. On my first day with the OR gear at Whistler, I got rather cold. I had a thermal layer and a thicker gridded fleece underneath, my usual setup under my other shell(s). Granted, it was chillier (20’s F) than my usual jaunts, but in subsequent days I added a Nano Puff and that fixed the problem. A balaclava under the helmet and mittens vice gloves took care of the rest when the temps dipped into the teens. This combo worked well and I found the jacket and pants moved nicely with the stretch and held up to snowfall or blowing snow and wind. Although I’m 6 feet and 170 pounds, I had to return the pants in size Large and exchange them for a Medium as I was swimming in the Large (Large works 99% of the time for me). But skiing was not the real test for this jacket, it was shoveling snow for hours at a time over the course of 5 days (so far). 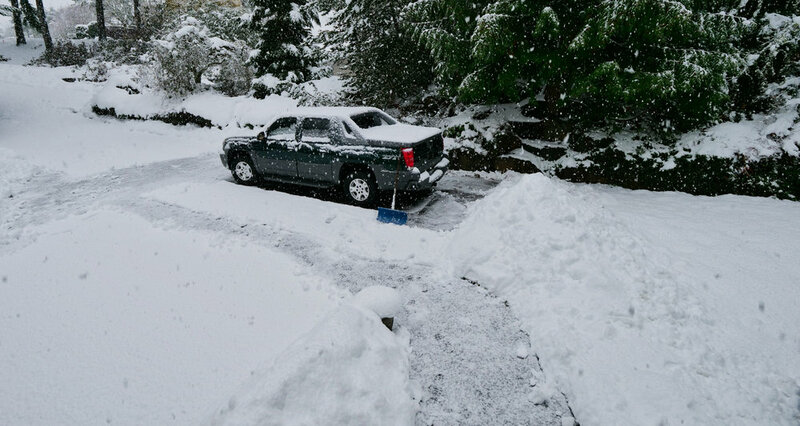 I’m at the bottom of a shared, steep driveway….it’s big. Long. And my lower portion is a big square that requires carrying the load from the center to a few boundaries where I had to sling it in ever increasing piles, made easier to mound because of the high water content. And I had to get the snow off my truck every day. I live in the outskirts of Seattle, so snow days are rare events, but this just kept coming. My last foray outside had me shoveling wet snow and slush in the snow and rain for more than 2 hours. My point? I worked harder by far than any skinning excursion. Now I didn’t wear the pants, but I had the jacket on every time, and after coming in from the soaking rain I shook it off and took note of my dry shirt underneath. Somehow this AscentShell™ managed to keep me dry despite pumping out lots of internal heat (no breaks) and being pummeled by snow and rain at the same time. I was quite impressed by this performance of a stretchy soft shell material. Limitations of my experience…..will it hold up over the course of an entire day of rain? I don’t plan to find out. It’s actually the experience of shoveling for hours on end, whilst at times being pummeled by snow and rain, that give me confidence in this soft shell technology. I won’t hesitate to pack this jacket and pants on any winter or spring hike, snowshoe, or ski tour from here on out; I’ll have confidence that it will perform. Oh, and I really like the pants, too. Skiing the Blackcomb Glacier, Whistler B.C. Superb weather trumped so so snow conditions on a January 29th, 2019 at Whistler. From past experience I knew that we’d have the sun at our backs, casting long shadows across the snow in the downhill direction. An added bonus was a stop to view the ice cave that resides at the terminus of the Blackcomb Glacier. I personally am not inclined to enter these caves, but many do. I was also testing the GoPro Hero 7 Black (chest mounted), which was a Christmas gift. I am quite impressed with the video quality and stabilization of this newer generation, especially compared to past models I have owned: Hero 2, Hero 3 Black and the Hero 5 Black. The improvements are quite noticeable, with no necessity to add software stabilization in post production. These sequences were filmed in 2.7K at 60 FPS with a flat profile, so I did employ basic color correction. The audio is also greatly improved….the “scritching” you can hear in this raw audio is due to my jacket zipper around the camera, as I had the camera harness on an inside layer. Warmth for a chilly start to the Seattle Half Marathon in November. Wind shirts; love them, hate them, think they’re an essential, or a total waste….search the various blogs out there and you’ll find someone supporting any of these positions. I guess it’s my turn to weigh in to add to the confusion, but I waited all season to come to a verdict and actually used the damn thing(s) in varying conditions. Enlightened Equipment offers the Copperfield in three denier iterations; 20D (@1 CFM), 10D (15 CFM) and 7D (35 CFM). I’m not going to pretend to explain the science of CFM, METS and so on, there are plenty of experts out there that can do a better job than I. I can tell you this: CFM=short for cubic feet per minute (cu ft/min). It is a measurement of the velocity at which air flows into or out of a space. METS=Metabolic Equivalents, where 1 MET is the resting metabolic rate….the higher the exertion, the higher the MET. So in the EE universe, the 20D will provide the most wind protection and the 7D is the most breathable. Biking: Lots of wind when you are cruising downhill at 35 MPH, and still some wind on the uphills when you are cranking. I’m not gonna stop at every hill bottom and top to don and doff a jacket. In April of 2018, I biked over 350 miles around the Olympic Peninsula, thankfully during a favorable weather window (no rain). During those times when it was too chilly for a single layer, but too warm for my biking jacket, I pulled out the miniscule EE Copperfield; not only does it weigh in at 1.91 ozs for size L, but I could cram it in small spaces on the limited real estate on my bike for easy access. And yes indeed, it provided just enough warmth in the morning and evening to keep my body temperature comfortable negotiating both uphills and downhills. Taking a break from blustery weather in Jerusalem. 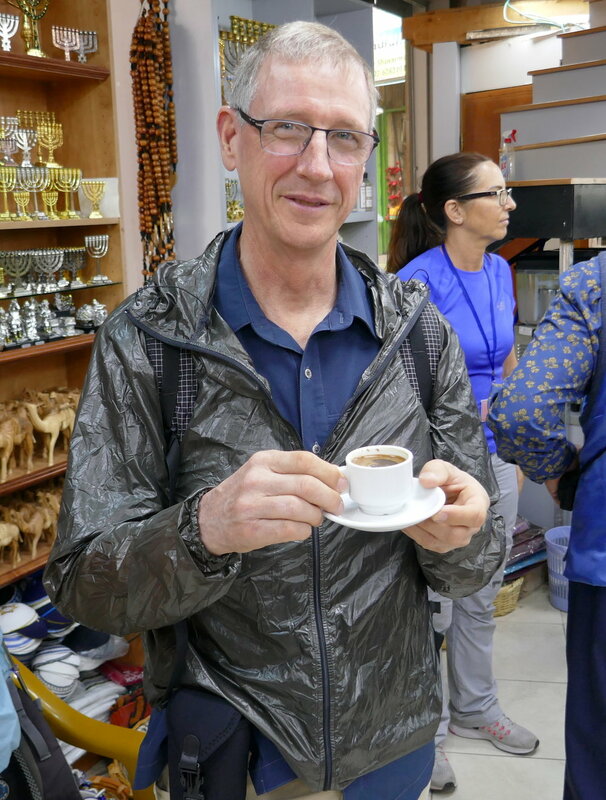 Tourism: During a trip to Tel Aviv, two of us opted for a tour of Jerusalem and Betheleham; however, the weather forecast was somewhat iffy, with rain showers and low temperatures. I wore the Copperfield most of the day. My buddy opted to buy an umbrella, but this jacket served me well for both warmth and rain protection. Now, at 35 CFM, this jacket is far from waterproof, but the showers encountered were brief, and I had just enough protection to stay dry. Any moisture on the jacket was soon dried by body heat and plain old air. My buddy wanted one. Racing: Running the Seattle Half Marathon at the end of November is always a gamble….will the weather be terrible or just bad? My daughter and I lucked out with sunny skies for this race, but temps were rather low, especially in the morning before the race started. I wore the Copperfield pre race and during the race until about mile 4, where I stripped it off and easily stuffed it into the small waist sling where I carried my phone and keys. Perfect. Nearing the end of a 118 mile day on the Olympic Peninsula orbit. Hiking: The Copperfield proved itself again and again for those conditions that didn’t warrant a jacket but were just a bit cold for a single layer. Just today I wore it on a morning trainer, 7 miles and over 2,000’ of climb and descent, some parts quite steep. My buddy stripped off his second layer, but I was good on the uphill, never reaching the point where I needed to vent despite the uphill effort…..more METS. Copperfield Wind Pants: Yes, I bought a pair, despite rarely needing to use them. However, I contacted the folks at Enlightened Equipment and asked them to do a custom fabric choice….I put 20D on the front half and 7D on the back. I wanted wind and moisture protection forward, mostly for moisture laden brush, but the breathability and venting of the 7D behind. Again, they are light enough and small enough to pack with little consideration for weight or space penalty. I have used them for transiting snow for sun protection and I packed them for a fastpacking trip on the Wonderland where I was moving for all but 3 hours….I didn’t use them during the day, but sure appreciated them trying to retain warmth in a minimal bivy for a few hours of sleep. Considerations: Before purchasing these products you must determine why you need them….what conditions do you anticipate, do you favor wind protection over breathability, do you run hot or cold? Humidity, temperature, elevation gain etc? I certainly wouldn’t don this jacket for ‘schwacking through brush, it wouldn’t take much to tear this flimsy fabric. I bought these with a wary eye, not sure how the jacket would perform with my use, but I have been pleasantly surprised with its versatility. I also deem EE products to be fairly priced, and these pieces provide a lot of bang for the buck….for me. I would caution to do your due diligence for fabric choice because there is a huge difference between this jacket in 20D and 7D. I’m usually a high output person in my endeavors, and the 7D performed admirably across a fairly wide range of output and conditions before I deemed it necessary to add or subtract a layer. When you look at this usefulness for the small package and extremely light weight, count me in as an advocate for wind shirts. Lastly, also consider that these products are made in the US, a bonus for sure. Custom Copperfield wind pants: 20D front, 7D rear. Transiting Silver Forest on the Wonderland Trail, September 4, 2018. I make no claims of hiking the Wonderland Trail more than anyone else, but surely I must be close. From my first hike in 1987 to my latest finisher, the Wonderland for me is a chronicle of my ventures into backpacking and the evolution of gear and experience. 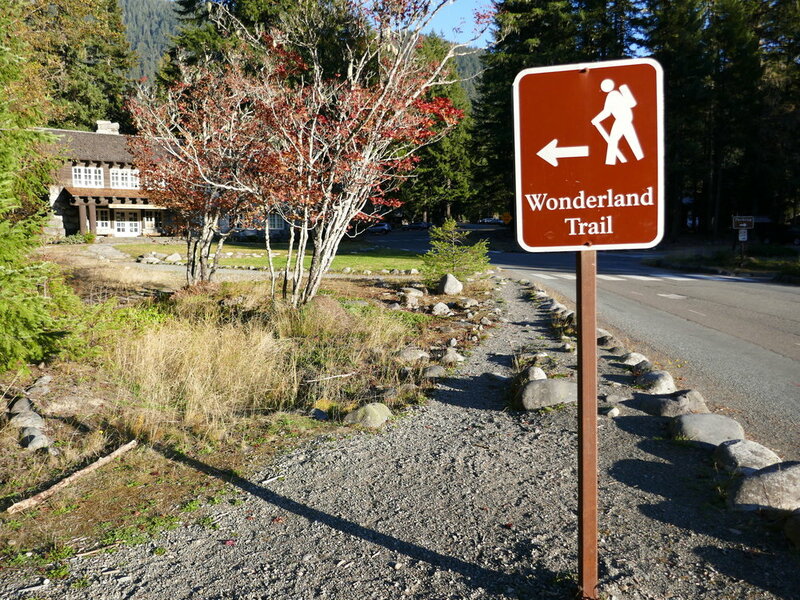 I’ve missed some years, and other years I’ve transited the Wonderland multiple times…witness 2012, where I hiked it 2.5 times to time lapse every foot of the trail. My last full transit was in 2015, where I enjoyed pristine weather over 3 days. This year I had a mind to hike the trail in under 48 hours, but was thwarted by increasing fatigue. However, altogether 2018 proved to be one of the most memorable hikes I’ve had over the past 35 years. Goats encountered as I near Sunrise on the September Wonderland section hike. Starting at Longmire on September 4th, I embarked on a fastpack attempt to cover the 93 miles in under 48 hours. I had spent some time in the park to this point as I was working on hiking every trail I had yet to set foot on, so felt relatively prepared. My plan was to hike clockwise from Longmire to cover the hardest section first so I could “cruise” the last 30 miles or so. Although I made good time with the numerous ups and downs, I slowed so much on the final climbs approaching Sunrise that I determined that I shouldn’t continue on. To that point I had hiked 57 miles and climbed 16,000 feet, taking a 3 hour nap in the process. However, I determined that there would be no “cruise” of the final 36 miles and 6,000 feet of climb so arranged (via InReach) for my buddy to pick me up at Sunrise. At that time I figured that would be that, as vacations and work would preclude me finishing the trail with decreasing weather windows. But then….. Through the Looking Glass; Mt. 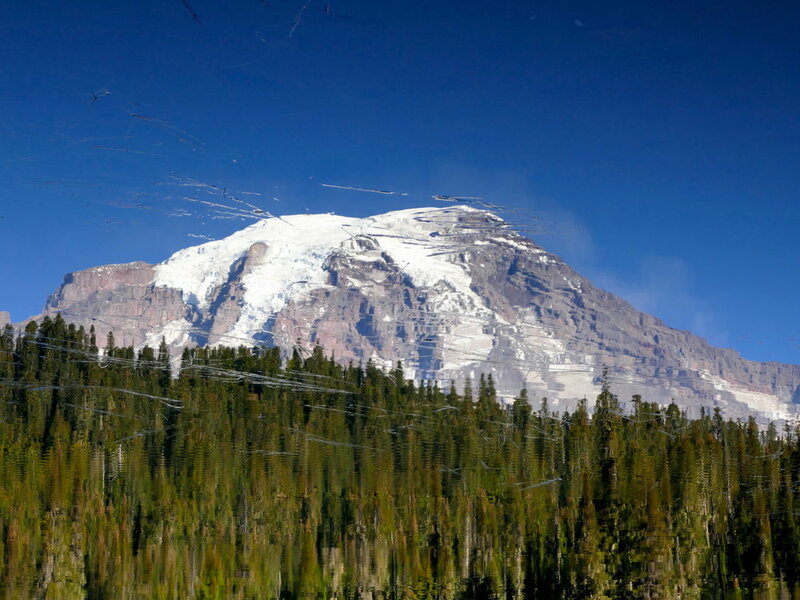 Rainier Reflection turned upside down in Reflection Lake. The Pacific Northwest enjoyed unseasonably good weather for over a week, and I was home for the end of it, October 21-22. Spur of the moment I decided to finish the trail by self supporting via bike, where I would bike from Longmire to Box Canyon and hike back on day 1, then reposition to Box Canyon on day 2, bike to Fryingpan Creek trail head and hike back. I had already been on the sections between Fryingpan Creek and Sunrise during the summer whilst engaged in other hikes. So on a beautiful Sunday morning I drove to Longmire and started biking at 8:25 AM, covering 18 miles and climbing 2224 feet to stash my bike in the forest at Box Canyon. Once again I called on my vintage Gary Fisher mountain bike vice my newer and considerably more expensive wheels as I was leaving the steed in the trees for essentially two days. Stevens Canyon Road bike view descending to Box Canyon. In the past I've described this section of the Wonderland as the least enjoyable, with overgrown brush and road noise from across the canyon. Today was a different day, and I immersed myself in my lonely surroundings. It's not often I'm hiking in this kind of weather but being surrounded by the last gasps of the flora as winter approaches. Peak color was gone, and the golden under story I had enjoyed just a few weeks prior had essentially vanished. However, the last gasp of the forest was intriguing in its own right and was a subtle reminder of the life cycles that affect every living organism. So instead of enduring this part of the trail like I had so many times before, I found myself reveling in this walk in the woods, completely immersed. This is a special feeling...perhaps the core of why I enjoy being outside. Before I knew it I was at Longmire with plenty of time to clean up, eat dinner and still be sound asleep in my truck before 8 PM. I slept until 6 AM...does it get much better? Hiking stats: 14 miles/2646’ elevation. Day totals: 32 miles/4870’ elev. End of Wonderland second section….back at Longmire. After sleeping for 10 hours, I drove to Box Canyon and retrieved my bike. Today would be a longer endeavor, so I was glad to start an hour earlier at 7:25 AM. 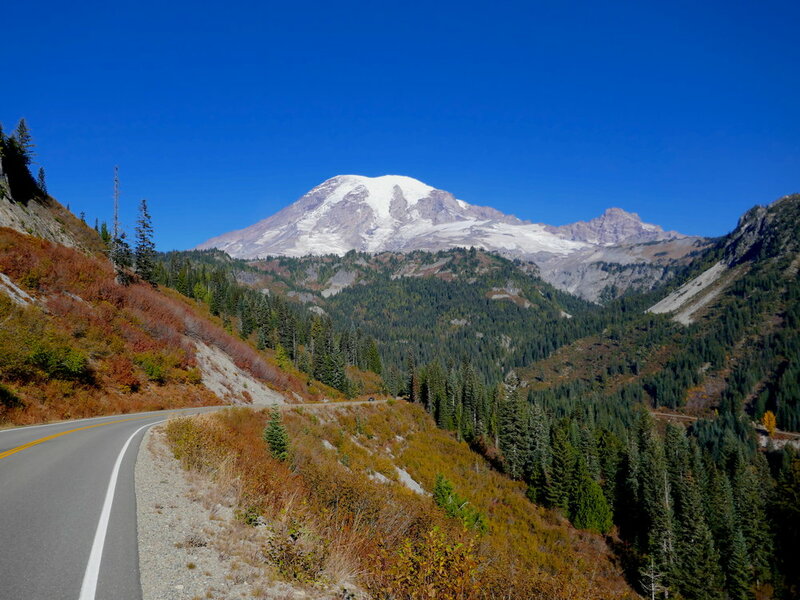 Aside from feeling a bit tired on the long climb to Cayuse Pass, I was satisfied with the enjoyable bike ride, including the 1,000 foot fast descent to the White River entrance to the park. 30 miles and 3,700’ elevation climb later I deposited my bike in the woods and took to ambulation. I had approximately 17 miles of hiking ahead and my start at noon at first had me concerned about schedule, but then I realized I had no schedule….if I could make the Cowlitz Divide before dark then I could enjoy most of the view portion of the day in daylight. With a single layer on top I sometimes felt like I was hiking in the summer, so mild were the conditions. It was only the low angled light and sometimes frozen sections of trail that reminded me of the lateness of the season. Although I passed a few returning day hikers on the ascent, when I arrived at Summerland it was deserted. Sans marmots and flowers, the still bubbling creek, brown meadows and complete solitude made for a rare experience in such a popular and accessible alpine destination. I lounged on a rock for a snack break, soaking in the stillness. Then I was off for the moonscape leading to Panhandle Gap, the highest spot on the Wonderland Trail at 6,800 feet. Aside from meeting two returning day hikers below the Gap, the rest of this day would be in solitude. There were a few icy sections leading to the Gap that necessitated careful footwork, but after that the transit to Indian Bar was delightful in afternoon sun casting shadows on “rock gardens” while the meadows of Banshee glowed pink as the day wore on. Indian Bar was also deserted, reminding me that I had the Wonderland Trail to myself this late in the season. I transited point 5920 on the Cowlitz Divide as it was awash in alpenglow, watching the sun set behind me while the almost full moon rose to my left. Eventually I had to turn on my headlamp before 7 PM but only spent about 2 hours in the dark, descending through old growth forest with light from the moon spotlighting singular patches through the canopy tangle. So engrossed with my surroundings was I that I was surprised to emerge at Box Canyon and my waiting vehicle, almost sorry the day had ended. The hike portion of this day entailed 17.5 miles with 4,800 feet of elevation. Total Stats for the day: 47.5 miles/8,500’ elev. Transiting the Cowlitz Divide on my Wonderland 3rd section. I almost skipped finishing the trail this year with the thought that, “Yeah, been there done that.” But once again I was reminded that no matter how many times I visit this old friend, new delights will surely come my way. By self supporting these loops, I also got to enjoy these two modes of travel, reveling in 35 MPH descents and trotting through old growth forest and the moonscape of Panhandle Gap. These last two days involved traveling 79 miles with 13,400’ of elevation gain/loss, all for covering the last 30 miles of trail and 6,000 feet. I wouldn’t change a thing, so now I’m looking forward to #32. A reminder that it’s October 22nd on the Wonderland Trail. While on vacation I had the good fortune to visit the small island Staffa off the Isle of Mull, which is entirely of volcanic origin. What makes it unique?….the incredible examples of columnar basalt of varying size, from huge vertical columns sporting a layer of non columnar basalt above to smaller examples epitomized in the small islet of Am Buchaille. This cave and area was an inspiration for Mendelssohn's concert overture "The Hebrides" and popularly known as "Fingal's Cave." William Picher provides the music for this short video, playing both organ and trumpet from his album Te Deum (Suite in D Major, IV March). I recently sold my old but still viable Feathered Friends 20 degree mummy bag and other gear as I try to consolidate. I needed a solid 3+ season bag, but have found that when the temps drop I am not a good candidate for quilts. This was driven home in 2016 on a chilly but not below freezing open bivouac at 7,000 feet on Mt. Rainier. 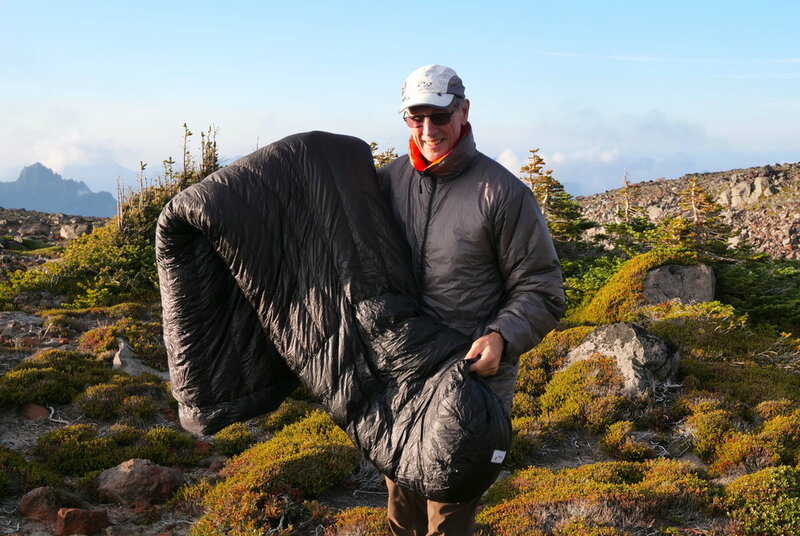 My sleep system for that evening was an Enlightened Equipment 30 degree Enigma quilt, a custom Borah Gear bivy bag (Cuben breathable top/Cuben bottom….before the change to Dyneema Composite Fabrics) and a Thermarest Neo-Air XLite pad. I’m a side sleeper, and the traditional quilt design does not seem to be a good fit for me. Every time I shifted position I would pump cold air into my little world, despite using the straps, buckles and cinching up the top. And yes, I was wearing warm head gear (a balaclava and the EE Hoodlum). In the wee hours I had to don my rain shells in an effort to trap more heat. To be clear I was not cold, I just wasn’t warm. There were no indications of freezing temps in the morning. Upon looking at various options for a new bag, I turned to Nunatak for the solution. My past dealings with Jan at Nunatak have been outstanding. I have been packing and wearing my Skaha Apex Pullover since last year and it remains one of my favorite pieces. It’s always in my day pack and ski pack. I was also the “prototype” and launch customer for the Akula Half Bag. 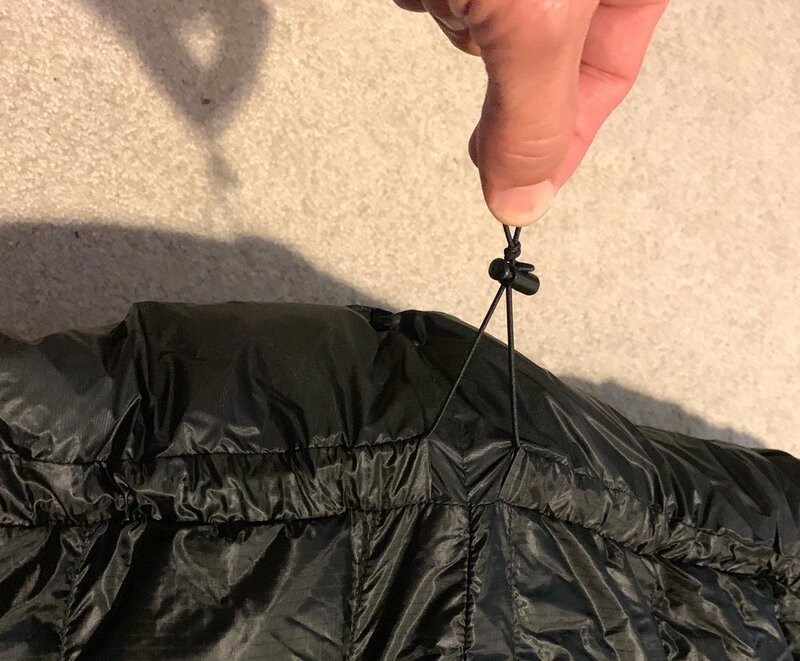 As Nunatak continues to improve and develop their designs, I sent my Akula back to have the bivy extension added….such a good idea, why didn’t I think of that? He only charged me $40 for this retrofit. And lastly, I have to point out that these products are meticulously constructed. So I didn’t want a full mummy, and I didn’t want another quilt. I decided on Nunatak’s 3D Quilt, which fills a niche between these two. Like my EE Enigma the 3D has a closed foot box, and the zipper extends low enough for this piece to function as a quilt. However, when the temperature drops I can zip it all the way up, essentially becoming a mummy bag without the hood. It may seem trivial, but one of the best design aspects is the placement of the cinch cords. My Enigma had one on the interior, so when I cinched that puppy up to try to seal in the heat, I had cord dangling around my face the entire time. The 3D puts two cinch cords on the outside, completely eliminating this annoyance from the draft collar. Plus, I don’t have to “uncinch” to get out, I can simply unzip as is. Shoulder Width: 62" minimum in quilt mode. 30" minimum with zipper closed. Shell Fabric: Breathable 15d Ripstop, Black. Liner Material: Breathable 10D Taffeta, Black. Zipper: #3 YKK Coil. One way. Inside/outside slider pull. I prefer my bags in black to assist in drying, and opted for the WPB foot and collar options. I also chose the 15D for the fabric for just a tad more durability, as this bag will probably be with me for the duration. And performance? My example here is another open bivy at 7,000 feet on Mt. Rainier. Same bivy bag, same XLite. This time I felt a bit cramped in the bivy as this bag is so much puffier. I was letting my daughter use my other Borah bivy, a roomier and more robust eVent custom job. I again wore my EE Hoodlum for head warmth. In the wee hours my daughter had to wear my Nunatak Skaha to stave off the chill in her Feathered Friends 35 degree Rock Wren, along with most of her clothes. My 3D was zipped up all the way and the draft collar was semi tight, I was wearing minimal layers and my head was outside the bivy. I may have had a little trouble sleeping due to the spotlight in my face the whole night (A.K.A The Moon) but certainly not because I was chilly. So toasty with no cold spots! I believe that Nunatak is conservative in their ratings. And despite frost on my bivy, I had no problems with moisture in this challenging environment (open ridge). I have a history of going minimal and light, including sleep systems (and still do), but sometimes I want the comfort of a full, warm system, in this case hanging out with my daughter. My package from Nunatak included the specs of this particular bag, right at 30.1 ozs including stuff sack. My total cost was $555 ($530 plus $25 shipping). This kind of quality doesn’t come cheap, but it’s worth every penny. I have yet to use the 3D in winter temps, but I have a synthetic 40 degree EE quilt which I will use as an over bag if needed. I’ve written this in a prior review of the Skaha concerning Nunatak, but I’ll repeat it here: If you want inexpensive look elsewhere. If you want to order extremely high quality, fully customizable pieces with an astounding number of options and choices, and don't mind excellent customer service from the owner and team that make up Nunatak, then spend the dough and take the plunge. Now here's the disclaimer, I paid full price for this product. Like the East Eastern Loop, the Northern Loop Trail, and the Eastern Loop, this journey is another example of shorter trips in Mt. 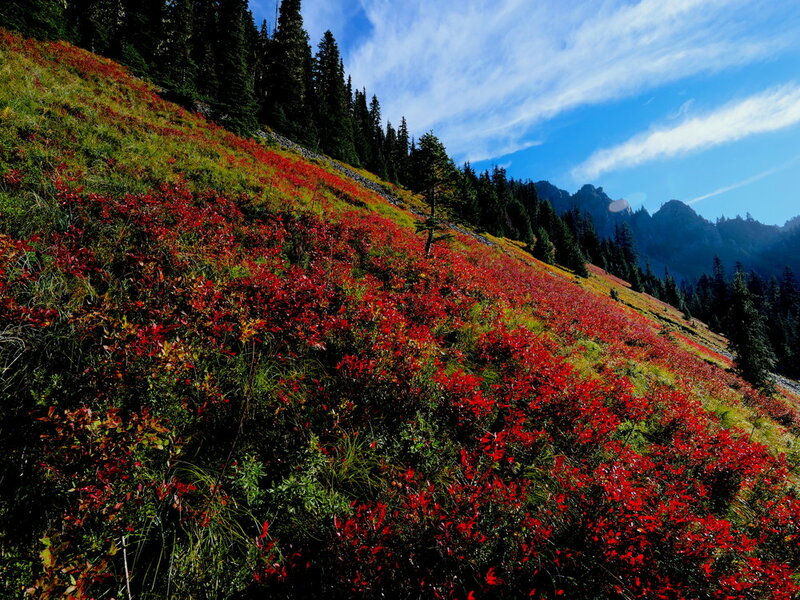 Rainier National Park that can be a day hike or a multiday, with plenty of places to camp along the way. In my case I made this a one day trip starting at Sunrise. Proceeding CW, I hiked the short section westward on the Sourdough Ridge trail until the intersection with the Huckleberry Creek trail. From this high point at 6800 feet the trail drops steadily, eventually exiting the park boundary and terminating at FS Road 73. 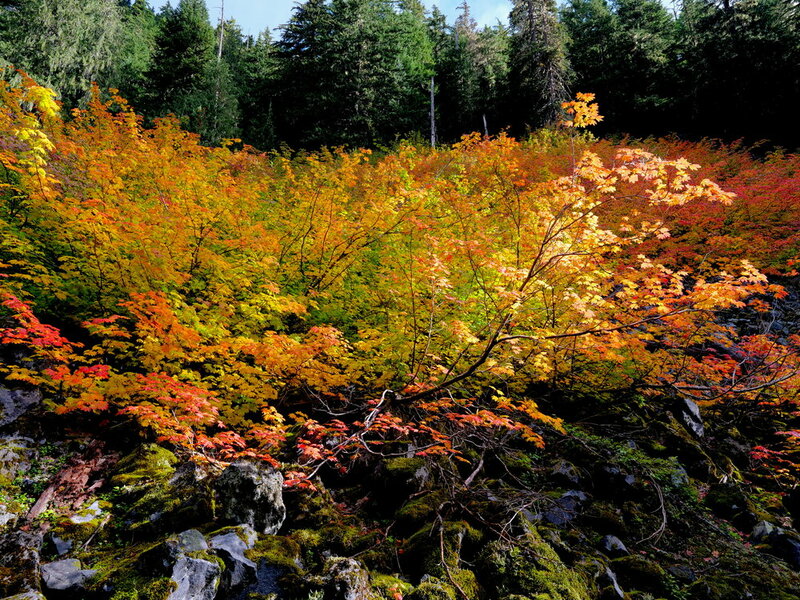 The Huckleberry Creek trail is another classic in this area, starting above treeline passing Huckleberry Basin, then dropping into old growth forest with bubbling creeks and the picturesque Forest Lake, all the while serenaded by the more substantial Huckleberry Creek. The trail is well maintained, soft and mostly rock and root free. Transiting this forest is surely a reminder that untouched forest is a national treasure, giving the hiker an opportunity to soak in the forest smells and refill water bottles from pristine sources. However, to connect this trail to the Lake Eleanor trail, one must walk a few miles on FS 73. When I did this hike on August 23, the weather turned misty but not rainy, making the steady climb up the road pleasant in its own right. After a few miles you come to the parking area for the Lake Eleanor trail, which reenters the National Park almost immediately. Once past Lake Eleanor the climb continues until eventually entering the anomalous flat land, Grand Park. This mesa is the only flattish expanse in the park, where more erodible material around this lava till isolated this unique formation. Although I transited Grand Park between "color" seasons (missing the bloom of spring flowers or the reds and yellows of fall), Grand Park lives up to its name at any time in any weather. It's truly an experience to walk the length of Grand Park on the well established trail, watching Mt. 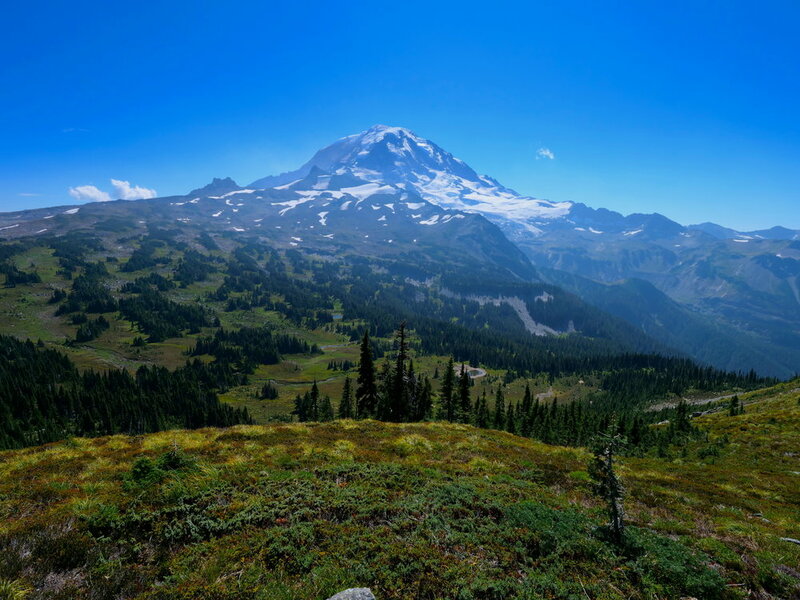 Rainier grow larger in the field of view. You may think that the show is over as you enter the forest again but more wonders await upon entering lower Berkeley Park. Lodi Creek that flows through here is the icing on the cake. Waterfalls, grasses and flowers abound well into late season, nourished by this continuing flow. Water Ouzels can be seen on occasion dipping for food in the pools along the way. In all my travels in this park over 35 years, the creek through Berkeley ranks as one of the most pristine, epitomizing the alpine meadow environment. On this late August day I quickly climbed out of the meadows into another ecozone, surrounded by towering walls with gradually disappearing meadows. The occasional marmot whistle echoed as I climbed to the intersection with the Wonderland Trail, now only a bit over 2 miles to go to return to Sunrise and completing the loop. The late afternoon sun at my back cast a long shadow on the trail ahead, while the winds picked up to the point of donning another layer. This 26 mile loop entails 5500 feet of climb and descent, transiting some of the coolest areas of the park through varying ecozones, from below 3000 feet to 6800 feet in elevation. Even the walk on FS 73 was pleasant in its own right, regaining a fair amount of elevation yet easy on the legs. In short, just another North West classic hike in one of our treasures so close to civilization.